One of my favorite things about decorating the nursery for a new baby is all of the little details. My daughter’s nursery is paper crane themed complete with paper crane mobile and hand embroidered paper crane baby quilt. 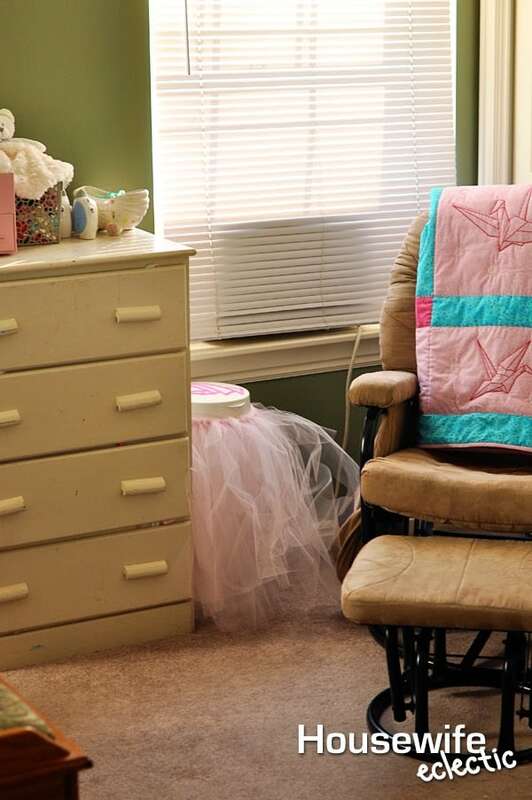 While we absolutely love our Diaper Genie, but I wanted it to match the decor of the room. All it took was some washi tape and tulle to combine cute and function. This is a really simple project, can be completely no-sew if you aren’t comfortable with a sewing machine. First measure out the elastic you will need for your Diaper Genie, about 30 inches. 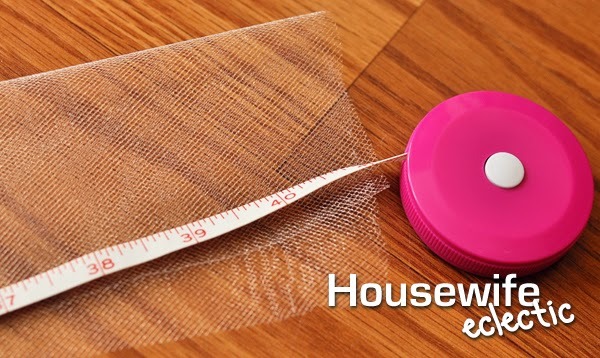 Sew the elastic together into a circle or glue if you aren’t the sewing type. 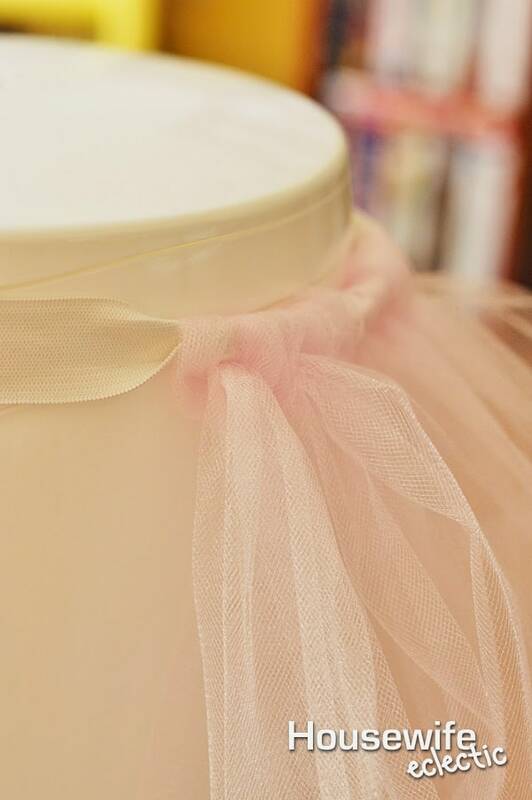 I like to use the rolls of tulle when I am making a tutu skirt, that way it is easier to make a lot of cuts really fast. Cut two rolls of tulle into strips 40 inches long. 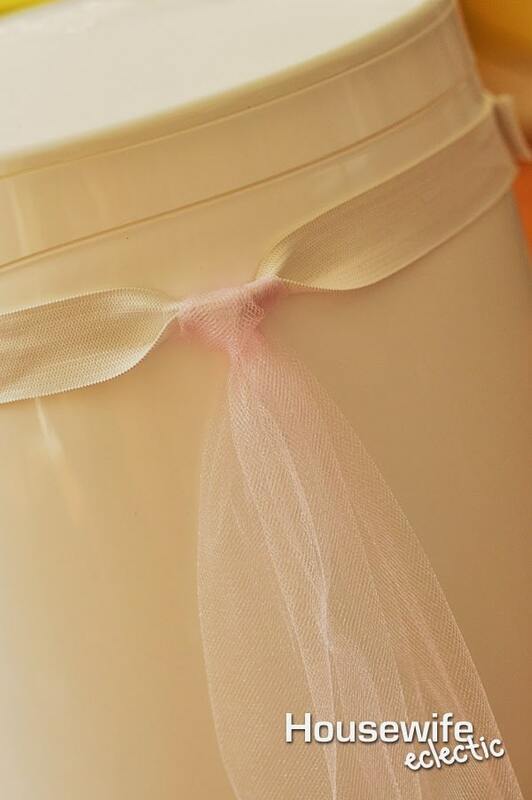 If you are placing your Diaper Genie against a wall or in a corner, you can use less tulle. Fold the tulle in half and place the tulle on one side of the elastic. Loop the ends over the elastic and through the loop created by the tulle and pull tight. 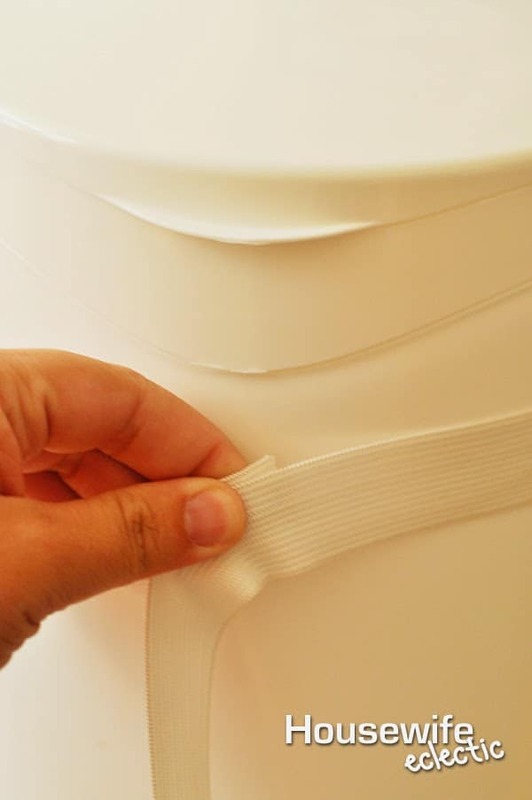 Continue tying the pieces of tulle all around the Diaper genie, scooting the tulle as close together as possible to create a fuller skirt. 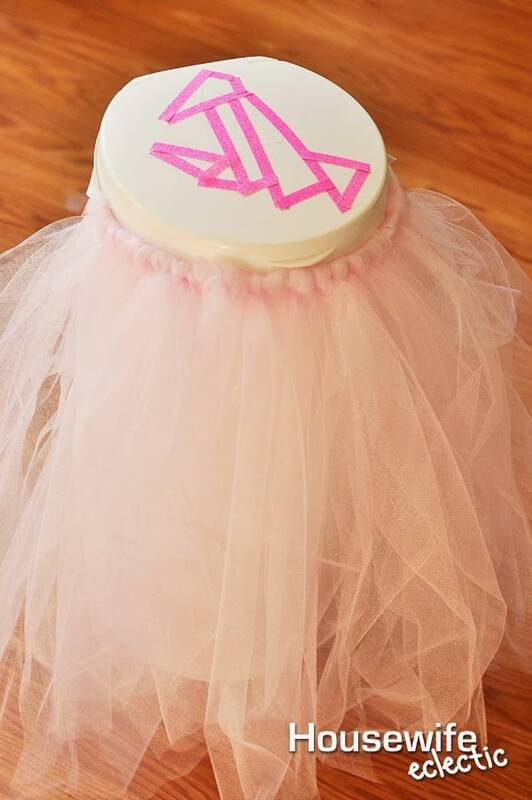 When you have filled in the entire tutu, you can move on to personalizing the top. Find a line drawing of an image that will match your nursery. For instance, since my baby’s nursery is Paper Cranes, I searched for a Paper Crane Line Drawing. If you are duplicating any words, you will need to flip the image backwards before you print it. Take the print out of your image and go over the lines you want to duplicate with a pencil several times. 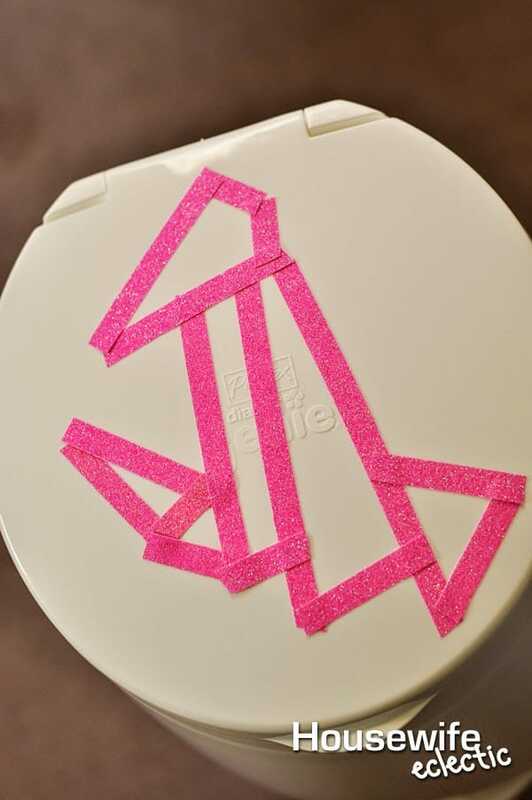 Flip the image over onto the top of your Diaper Genie and rub the back of the drawing until you can see the faint pencil lines. Using stripes of washi tape, go over the design until it covers all of the pencils marks you made. 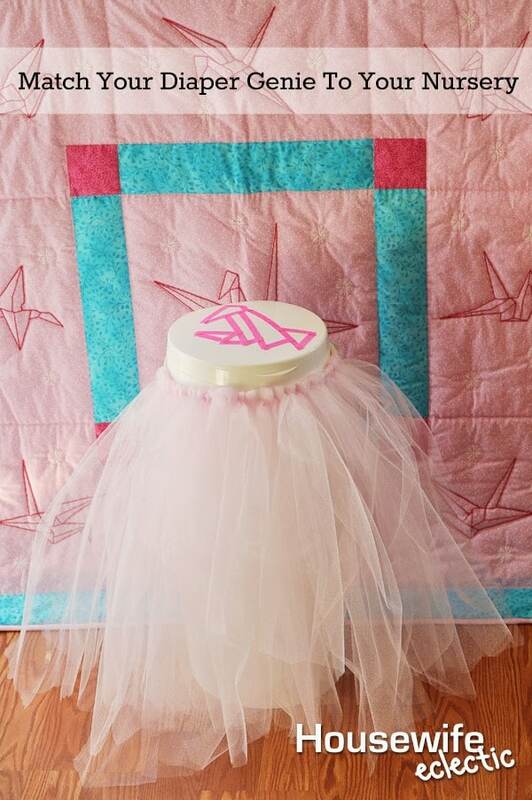 Add the tutu skirt to the Diaper Genie and you have a cute but functional piece for your nursery. What I absolutely love about this project is that is completely removable, so if your next child is the opposite gender, just remove the pieces and you have a white Diaper Genie again. 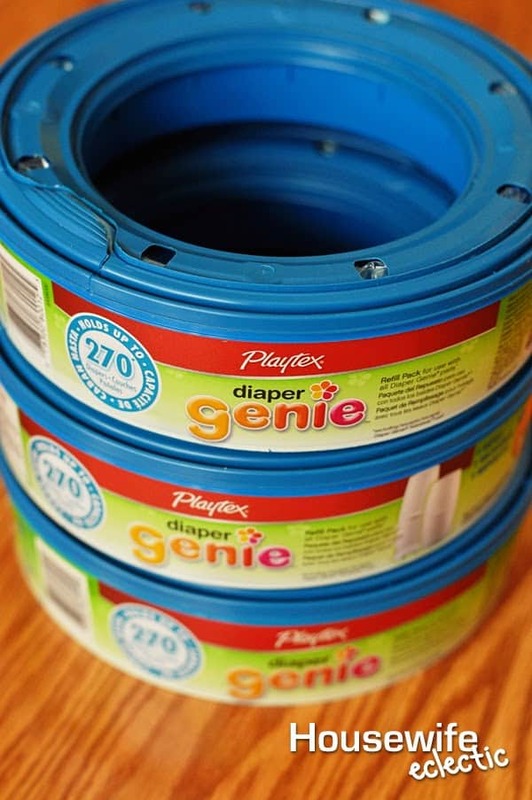 Right now, while supplies last, if you purchase three Diaper Genie Refills in the same transaction at Target, you can go here and submit a picture of your receipt to get a $25 Spa Finder gift card valid at spas all over the United States. Submitting for my gift card was easy, I just took a picture with my smartphone and emailed it to the address listed on the form. I had my gift card in less than an hour, I am going to use it to help pay for a massage, every mom I know could use one. What about you? Do/Did you have themed nurseries for your babies? That's a really cute idea! Great way to make it look more pleasing to the eye. That is so super cute and creative. My daughter is all about pink and princesses. That is a super cute idea!! That is such a good idea. I will let some friends know who are expecting.. very cool!! Such a great idea to make it go with the room. We had a paper crane theme for our wedding. 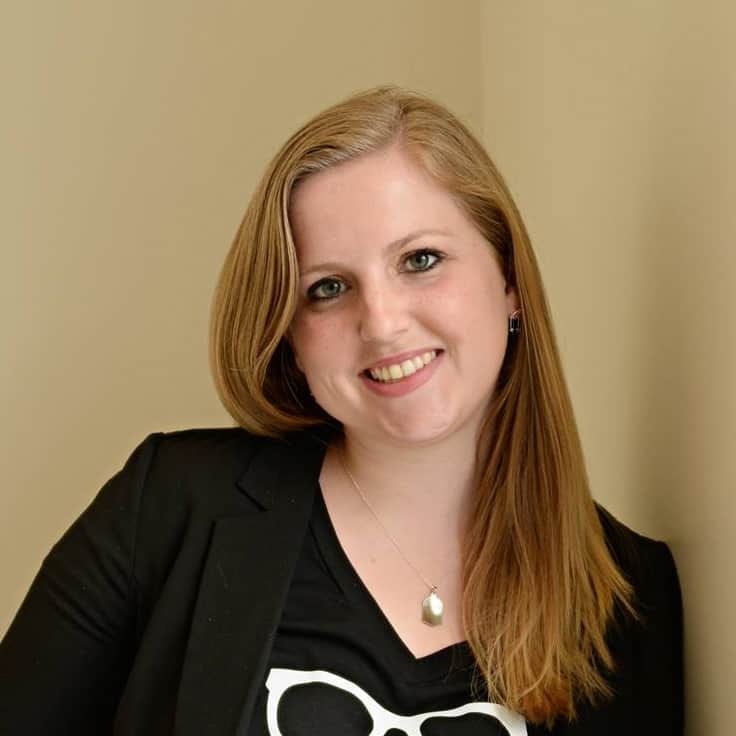 I purchased 1000 cranes online and they were everywhere – it was beautiful! I can't believe I never thought to do that. That's seriously the cutest! It seems to be all about the tutu covered diaper genies these days! Oh my gosh that is too cute! I love this idea…but how could I decorate it for a boy? !